On May 8, 2015 our Bridging Historias through Latino History and Culture: An NEH Bridging Cultures at Community Colleges Project concluded with a full-day conference at The Graduate Center, CUNY. More than one hundred educators from colleges, libraries, high schools, and public institutions across the region attended the panels, workshops, poster displays, and keynote speech. The conference opened with a plenary panel entitled “Infusing Latino/a Content into the Curriculum—the Big Picture” that explored the broad institutional context for implementing Latino Studies at community colleges, reviewed Latino enrollment in higher education, provided examples of innovative configurations, and discussed the impact of Latino Studies on Latino and non-Latino student populations. 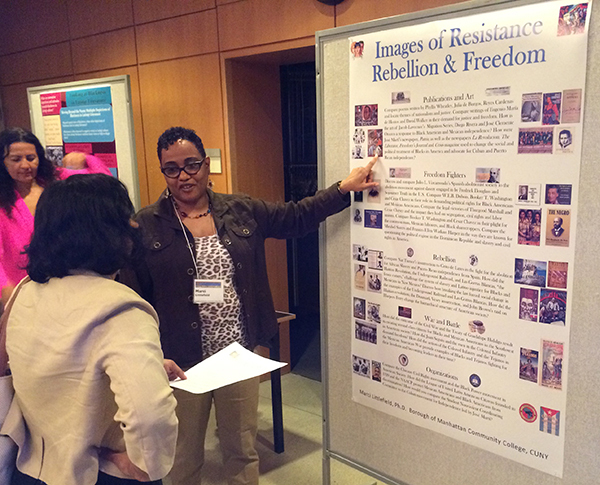 Following the opening panel, Bridging Historias faculty and administrators presented the curricular work they developed during the two-year program in six panel presentations, three workshops, and six poster displays/discussions. The day closed with a keynote talk, "Why Latino History Matters," by Vicki Ruiz, University of California, Irvine, professor and president of the American Historical Association, who offered an overview of the field of Latino history and connected it to larger themes, debates, and sources in U.S. history. 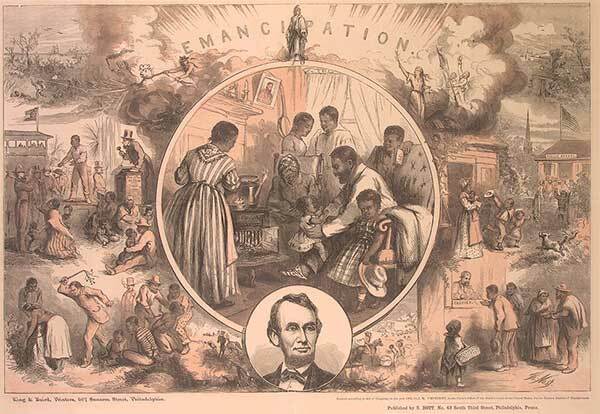 The National Endowment for the Humanities has awarded a grant to ASHP to host a two-week institute in July 2016 on the visual culture of the American Civil War and its aftermath. Following on the heels of our successful summer 2014 institute, this iteration will extend its purview to encompass the ways the war was recorded, reported, represented, and remembered via an array of visual media—including the fine arts, photography, cartoons, prints, and a range of “ephemeral”pictorial items and publications—as well as the visualization of Reconstruction, the postwar West, and the rise of Jim Crow. Institute participants will work with leading scholars in the field and take part in hands-on workshops in local museums and archives. Sessions will address photography and the war front, painting the war, prints and the home front, illustrated journalism, wartime cloth and clothing, envisioning emancipation, the visualization of Native Americans and the postwar West, maps, political cartoons, monuments and memory, and the visual culture of Jim Crow. Institute activities will introduce the rich body of scholarship that addresses or incorporates Civil War and postwar visual culture, encourage further research in the field, and assist participants in developing approaches that use visual evidence to enhance teaching and researching the history of the Civil War era. Click here for further information about the Institute—and check back later this fall to apply! Over the summer we received news of funding that will allow ASHP to build two additional “missions” in the award-winning Mission US series of online adventure-style games in which players take on the role of young people during critical moments in U.S. history. In June, the National Park Service awarded our project partner public television station WNET-Thirteen a grant to create “Prisoner in My Homeland,” which will place students in the role of a Japanese American teen-aged boy who must make choices as he and his family are forced to leave their home on Bainbridge Island, Washington, for one of the “temporary detention centers” and then to one of ten WRA incarceration sites during World War II. In July, the National Endowment for the Humanities announced funding for “No Turning Back,” a mission that will take place in Mississippi during the summer of 1964 and explore the fight for voting rights undertaken by young people there. Visitors to The Lost Museum are given the opportunity explore a 3D recreation of P. T. Barnum’s American Museum in mid-nineteenth century New York. The redesigned site, launched to commemorate the 150th anniversary of the fire that destroyed the museum, includes larger, higher-resolution graphics and easier navigation of the museum. Visitors also have the option to seek out clues to discover who, among suspects representing social and political figures of the period, may have set the fatal 1865 fire. The site’s annotated digital archive of materials from the American Museum is improved as well and is now mobile-friendly and more easily searched. 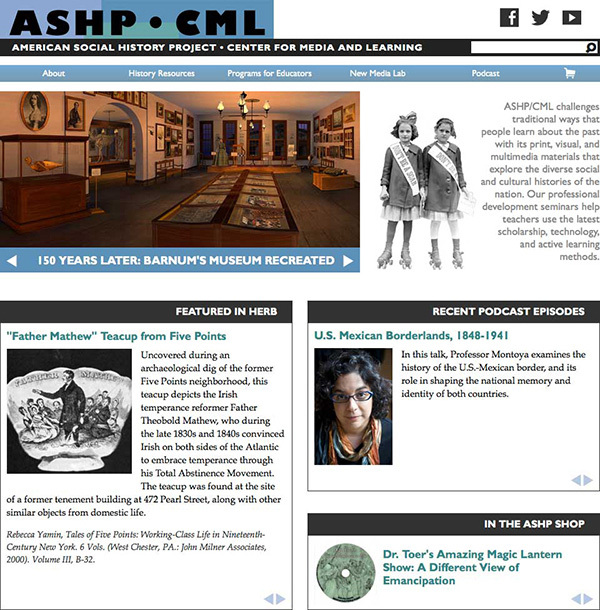 The virtual museum first launched in 2000 and was produced by the American Social History Project/Center for Media and Learning at the City University of New York Graduate Center and the Roy Rosenzweig Center for History and New Media at George Mason University, with support from the National Endowment for the Humanities. ASHP’s primary site was relaunched with the goal of providing easier navigation, especially for mobile users, and improving communication with our varied constituencies. Improvements include a cleaner home page, integration of news and featured content across the site, easier than ever shopping for ASHP’s documentaries, and a news section for updates between issues of our newsletter.